We are now well into March and with the improved weather sees the start of tackling jobs in the garden. Having had a lot of success two years ago from creating new strawberry plants from all the runners off my existing plants, an additional bed was created. It was rather a rushed job and was not particularly tidy. Now normally I would get someone else to complete any hard landscaping, neither mine or my sister's skills are up to erecting a greenhouse, setting up raised beds etc. We know our limits! When I was offered a new product for bordering a lawn or garden bed I knew of just the area in the garden that would benefit - my strawberry bed. 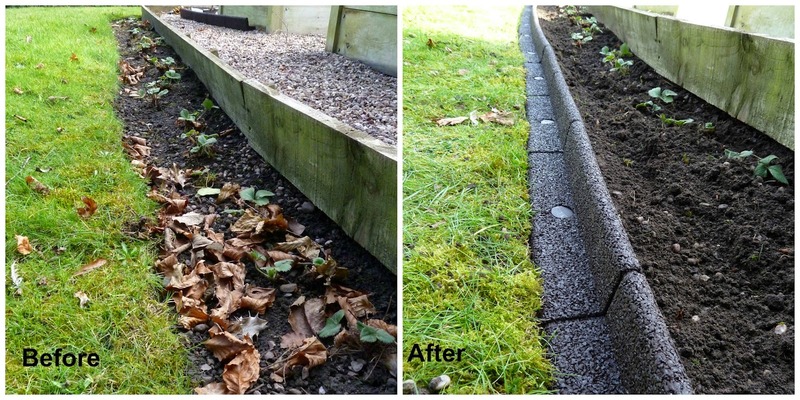 EcoBorder by The Plasticspeople is made from recycled tyres, and come in 4ft lengths and can bend up to 70 degrees. The details of the product appeared straight forward, aimed so that even a novice gardener/DIY'er can install them. They come in a choice of 4 colours - brown, grey, black and red. I selected brown as I thought it most suited the location. Equipment needed: a mallet or household hammer and some gloves. 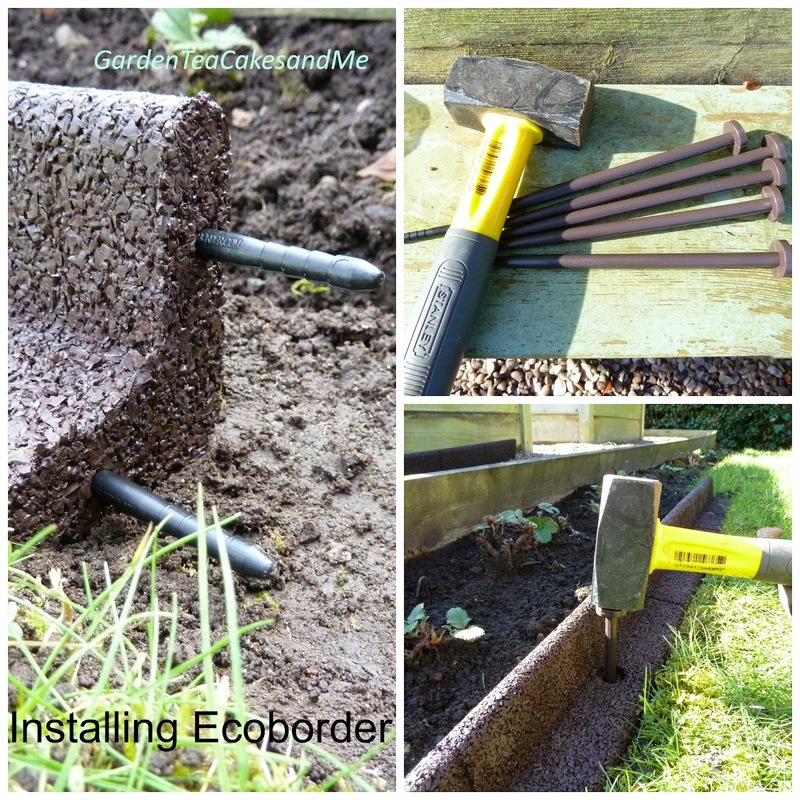 The EcoBorder comes with connector rods to join each piece together and stakes to secure them into the ground, along with easy to follow instructions. Preparation: prepare the ground and border area first. Ensure the area it will sit is flat and clear of stones. Fitting: The connecting rods easily push in by hand, place each piece together along the border. Then using your hammer, tap the stakes into place starting at those nearest the joints. There was a corner to my border, now this is where a little help was needed. I did have to call on my father to lend his mitre block, to create the correct angle to join the corner pieces together. If you do end up needing to cut the border, the job of sawing was pretty easy given the state of the saw my sister was using. So what do you think? I think the border looks tidier and more presentable. The edging on the border will allow for the lawnmower to get right to the edge of the lawn when mowing. that you can quickly transform a border and tidy an area up with minimum effort. The mower edge design means no more lawn edging for this border. I have also prevented some tyres going to landfill by reusing them as a recycled product. landscaping a walkway, flower border or vegetable border. I bet the red colour border would look great for a child's play area. The pack of 6 borders were quite heavy, but once opened the individual pieces were easy to carry, manage and fit. I have only had the EcoBorder fitted for a few weeks, so I can not comment on the prolonged installation of them. Though I am expecting them to wear well being made from recycled tyres. I will keep you posted should they fade, though I understand this should not be an problem. a 6 pack of 4ft lengths cost £59.98 plus postage and can be ordered from the PlasticPeople website. Disclosure: I was sent a 6 pack of EcoBorder for the purposes of this review, all opinions expressed are my own. This is such a great idea! My garden is all paving, however, so it wouldn't work! Just another excuse for me to move house; somewhere with a proper lawn! I am so not the gardener, but the garden/lawn borders look so nice. Maybe one day I will be able to do that.